Exquisite villa overlooking the Mediterranean, only a three minute walk to the beach. Private pool and hot tub with outdoor kitchen is perfect for entertaining. This unique villa is elevated above the beautiful Lagos coastline and nestled amongst pine and 8eucalyptus trees. 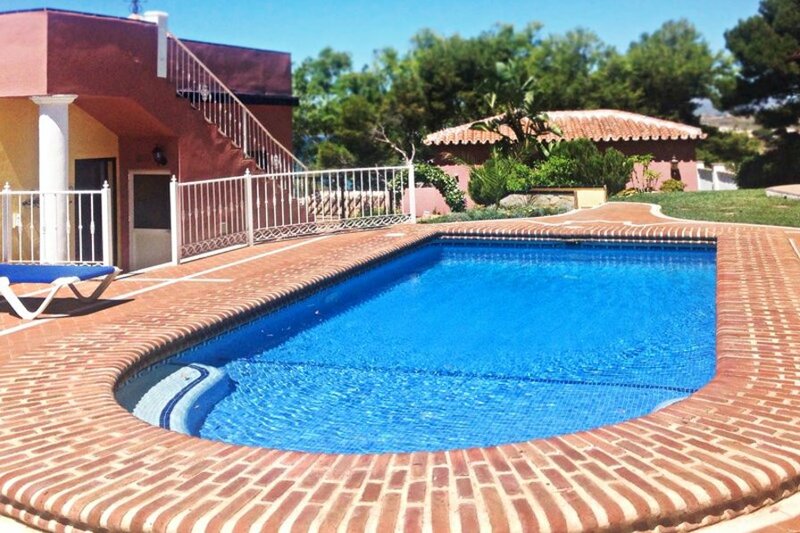 From its spacious covered porch and three terraces, you will enjoy a 180 degree southern view of the sun-kissed waters of the Mediterranean, and a panoramic view of the majestic peaks of the Sierra Almijara Mountains to the north. Enjoy your holidays at the Villa La Sirena while lounging by the pool watching the sailboats drift by catching up with a loved one over a drink on the terrace or combing the beach for seashells—only a three minute walk down the drive. Covered outdoor eating area with fully equipped kitchen and BBQ next to the private pool and hot tub area overlooking the sea. Perfect for entertaining large groups and families. Pool can be heated at an additional cost.